This is the place for you if your cruise affords a little extra time. Desolation Sound offers bays, coves, and inlets within inlets to explore. Seals and other wildlife flourish in these warmer waters and you can find enough oysters to feed a logging camp. Princess Louisa Inlet guarantees you the warmest sheltered water for swimming and snorkeling. Look for Native Canadian Indian pictographs along the granite walls - close your eyes and you'll feel like you're back in time. Chatterbox Falls is a must see with its 120 foot vertical drop which makes it one of the most photographed scenes in BC. Take a chance to hike up one of the many trails ashore to explore treasures from the past when old logging settlements dotted the area, you never know what treasure you might find. As BC's largest marine park, you can spend all the time you want admiring the waterfalls, lakes and waterways. The snowcapped peaks of the Coast Mountains provide an ideal backdrop for this paradise. As one of the most sought after destinations in the Pacific Northwest, Desolation Sound may be "Heaven on Earth." 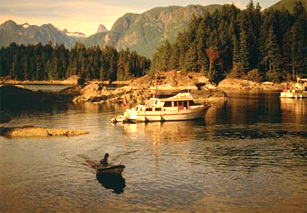 70 to 75 degree water, majestic coves and mountains rising from the shoreline, Desolation Sound will simply engulf you. Day 1 - Ship Harbor Yacht Charters to Bedwell Harboor - Located on South Pender Island, Bedwell Harbor Resort offers moorings and anchorage. You will clear Canadian Customs here. Day 2 - Bedwell Harbor to Nanaimo - The second largest city on Vancouver Island, Nanaimo is a natural point of departure for Desolation Sound. Day 3 - Nanaimo to Pender Harbor - Pender Harbor offers numerous marinas and restaurants. Part of a complex of coves, you will find anchorages or moorings if you choose. Day 4 - Pender Harbor to Cortes Bay on Cortes Island - Your first glimpse of Desolation Sound! Cortes Bay is a well-protected beautiful harbor. Day 5 - Cortes Bay to Grace Harbor - Part of the Desolation Sound Marine Park, Grace Harbor is a favorite of many. Day 6 - Grace Harbor to Prideaux Haven - A series of coves make up this popular spot known as Prideaux Haven. Enjoy the splendid mountain peaks hovering over you. Day 8 - Prideaux Haven to Squirrel Cove - Squirrel Cove is located on the east side of Cortes Island. Anchor out or find room at the public dock. Day 9 - Squirrel Cove to Gorge Harbor - Gorge Harbor hosts a great anchorage in this large bay. Keep your eyes open for Indian pictographs as you enter through the narrow cleft. Day 10 - Gorge Harbour to Hornby Island - Beautiful sandy beaches make Hornby Island an excellent swimming stop. Day 11 - Hornby Island to Schooner Cove and Resort (Vancouver Island) - Schooner Cove is located on Vancouver Island and has all the amenities expected of a first class resort. Day 12 - Schooner Cove to Montague Harbor - Part of the Canadian Gulf Islands, Montague Harbor is a great getaway. Day 13 - Montague Harbor to Deer Harbor - Back home in the San Juan Islands! Located on Orcas Island, this is an excellent place to have last night's dinner.